6 Four Drawer unit to give valuable storage. 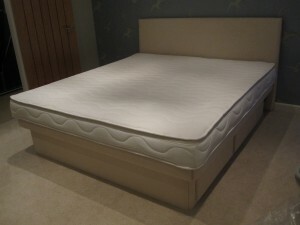 7 Delivered and installed by ‘Bed Tech’ professional installers of adjustable beds and waterbeds. If you wish to know why someone would want to upgrade from a hardside to a softside, then it may be a good idea to read our information held on our website. This explains the benefits of a softside waterbed and how they have evolved and improved over the years. It may also be worth checking out our questions and answers pages in order to gain a little more knowledge on the subject. Depending on where you live, it may be worth a trip to your nearest specialist showroom. High & Dry Waterbeds is a division of High & Dry Manufacturing Ltd which has its retail showroom in Portsmouth and factory showroom in Chichester. At either location you will be able to try the full range of beds including the electric adjustable beds which are a fantastic help when it comes to mobility problems. An adjustable bed may not offer the same level of comfort and support but the profiling of the adjustable bed mechanism will benefit a whole host of medical conditions and still be extremely comfortable. This entry was posted on Wednesday, November 24th, 2010 at 12:44 pm	and is filed under Waterbed Gallery. You can follow any responses to this entry through the RSS 2.0 feed. You can leave a response, or trackback from your own site. A few additional notes to go with the seven options of our build a waterbed feature http://www.bed-adjustable.co.uk/build-a-waterbed/ are firstly step one. The Olympia deluxe is a far superior waterbed than the standard Olympia. http://www.bed-adjustable.co.uk/waterbeds/softside-high-and-dry-water-beds.html Step two, all styles are available in a range of sizes from single to super king. It is worth mentioning that there is a certain amount of confusion when classifying the sizes. The reason is that waterbeds were made popular in America where a five foot wide bed is classed as a Queen size waterbed, where as here in England a five foot bed is a king size. The reason retailers adopted the American sizes was because the original waterbeds were imported from America. Some of the unusual sizeshave pretty well faded out like the super single which is four feet wide and seven feet long. A bed six feet wide and seven feet long is a standard king size waterbed in America but you would normally struggle to find a bed that big.